I love getting feedback from the new puppy homes! Sounds like Bandit (Lillys black & white boy) is settling in nicely! with a lot of love and care. Those cats definitely are unpredictable, but you can be sure that the new puppy almost always wants to make friends! 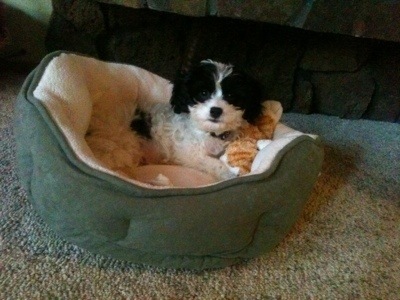 This entry was posted in Adopted Puppies, Black & White, Buyer Feedback, Cavachon, Lilly, Sonny. Bookmark the permalink.